“Making headway, one step at a time”. This was the last communication from Joe Bell on his epic quest to walk across the United States and do everything within his power to end bullying, intolerance and suicide. His journey was not the result of an idealistic publicity stunt. It was a mission. A truck whose driver allegedly had fallen asleep at the wheel struck Joe down yesterday killing him as he fought in valor as a dad, and a hero. Others gave insight to the environment the Bells faced. “ CMar74” addressed this by stating about La Grande, “the culture of intolerance in that town is horrific and am thankful we removed our family from it. The loss of Jadin was a loss to the world. According to a family friend, he elevated those around him with a “couple quick words and everybody would just forget about their problems and smile. 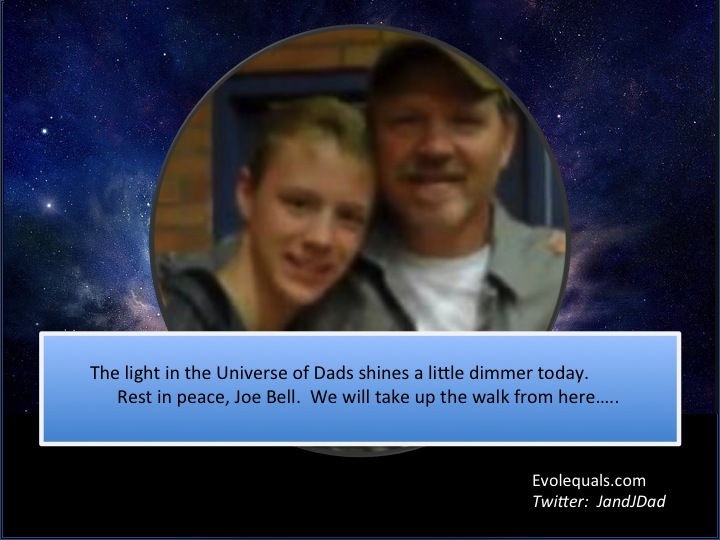 He just had a gift.” That loss could not have been felt more deeply than in the heart of his dad, Joe Bell. As a dad, I relate to the soul that I know was in Joe. I know the feeling of looking at my sons and experiencing a love beyond that which I could ever dream possible. It is a love in which you want for, you would die for, that person to get every wish, every hope, every accomplishment they imagined. It is a love which puts the other person first unequivocally and calls for any sacrifice to keep them safe, healthy and well. On the day Jadin died, I know as I breathe, part of Joe’s soul had to have been decimated. Mine would have been. According to his Facebook page, Joe “figured he had two choices, lay down and give up or stand up and walk.” For me, as it was with Joe, in that situation there are only two choices, lay down and die or fight to the death against the thing that killed your kid. Moments before Joe was killed, he looked at a sign that said “Wild Horse 7”. Life, the ultimate wild horse, was about to knock him down, and end the pain and mourning that he still must have been carrying in his gut. We will walk. We will fight. We will love with a force that will eradicate fear, homophobia and the individualized terror known as “bullying”. We should have done it earlier so Jadin would not have had to die, and Joe would not have had to walk. We can do it now, however. It is not too late. I wish we could have done it for Jadin, but as Joe knew, there are more “Jadins” out there, and we can do it for them. And now, we can also do it for Joe. To Joe, from me, and many dads out here: You died in the line of duty of being a dad. Rest in peace, man, we will not let you go in vain. This entry was posted in Uncategorized and tagged bullying, Colorado, Dad's love, gay teen, homophobia, Jadin Bell, Joe Bell, suicide, Truck accident, Walk for Change. Bookmark the permalink. So tragic that in this day and age Joe’s WALK was necessary..
Help Joe Bell ‘continue his walk’ by sharing this on your Facebook page. How tragic. Thank you for sharing. I’m reblogging this to help ‘continue the walk’. I didn’t know anything about this story. Thank you for sharing. So very sad, but also what an inspirational dad. I am struck by the cowardice of the commentators. Not only because they spew hate from behind an anonymous handle, but the fact that their own heterosexual identity is so threatened by the existence of a gentle soul like Jadin. I am torn between wanting to destroy these haters and wanting to reach out to them. I will always seek to do the latter, but I feel the former so powerfully. I am devastated every time I read about a child that commited suicide because of bullying. I am deeply sadened by this tragedy and i sens my deepest sympathy to the family and friends left behind. I sincerely hope that by the small, personal effort of everyone, we will wipe out bulling and discrimination one day…soon. So incredibly tragic. When will these tragedies spark others to take up the walk? Incredibly tragic. Does anyone know if there is a wife and mother in the picture? If so, she must be just sinking into the abyss. What a beautiful and touching tribute. So very sad. You’re right – we all need take a stand, walk and shout so this doesn’t happen again. This is so sad! Life happens …. many times we don’t know why.